After a perfect walk at Brittas Bay we drove inland, destination being the little village of Avoca. This tiny place rose to fame in the BBC series Ballykissangel. I have to say we never watched this and it has been years since the show was axed, the fame of Avoca though still lingers and draws tourists. 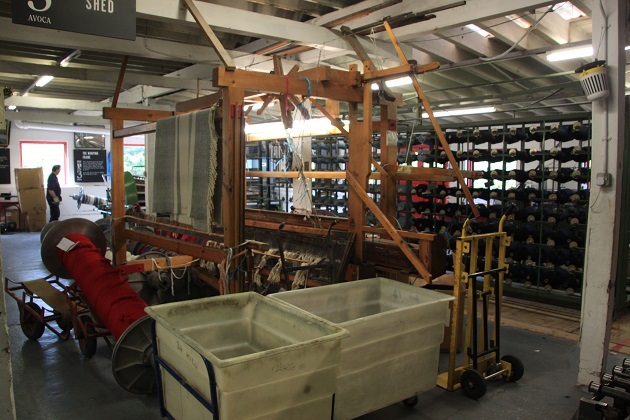 Our reason for a trip here was to visit the Avoca Handweavers. 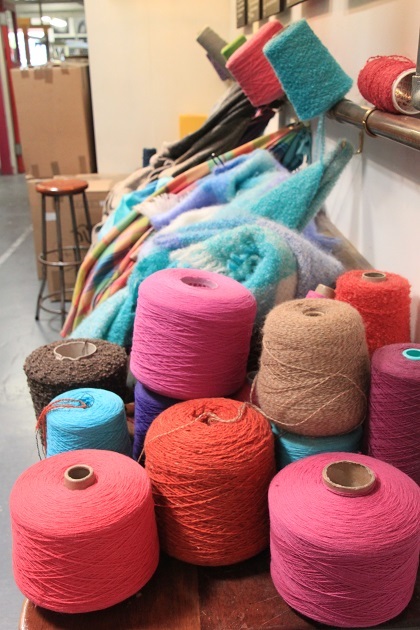 I have frequented their shops in Belfast and Dublin many a time, love their rugs, throws and other products and definitely couldn’t resist the chance to see where these beautiful products are made. 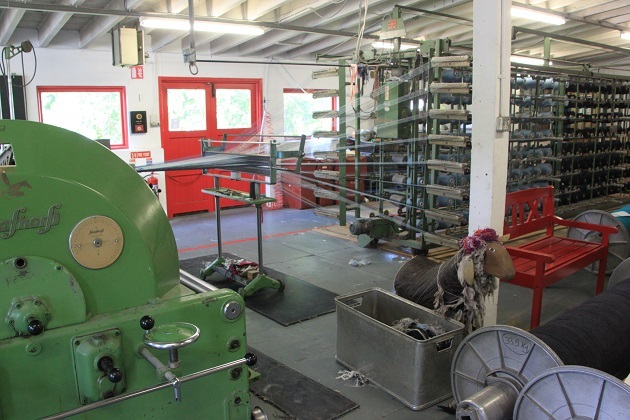 This is Ireland’s oldest working woollen working mill and is said to be the country’s oldest surviving business, founded in 1723. 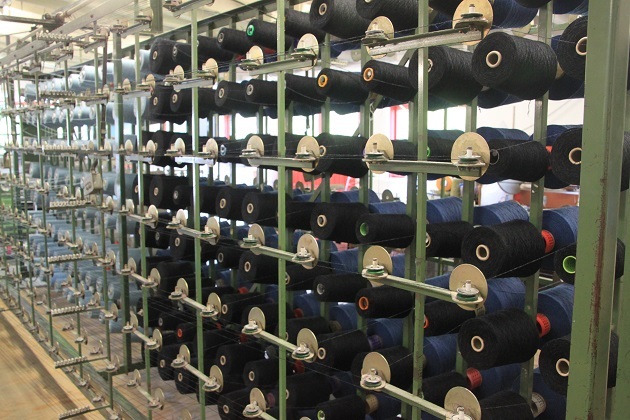 My family history is steeped in the Irish linen trade, woollen weaving is something different but equally intriguing. The whole place is beautiful, a series of whitewashed traditional buildings, gorgeous gardens and the most glorious picnic area right by a little stream. You could come here just to enjoy that. Our first port of call was the tea room. The food offerings in their in-store restaurants are always superb, here it was no different. They had delicious homemade cakes and other treats on offer, we feasted on some of those washed down by a welcome cup of tea. A quick browse in the shop – how could I not – before we headed to the Visitor Centre. Here they tell the story of the business from 1723 in an informative and interesting way. After that it was into the mill to watch the weavers at work. There is no entrance charge, the tour is self guided and there are lots of information boards at various places to let you know what is happening at each stage of the process. I found it fascinating, the lack of health and safety rules was also rather refreshing. We, including Son who is a big fan of any factory and place full of machines, were able to get up close and see what was going on. You can take the tour at your own pace – as fast or slowly as you like. The whole place is so colourful and so interesting, it definitely gave me a much greater appreciation for those lovely products in the shop. A fantastic afternoon. It’s a beautiful spot as well as a great tour! 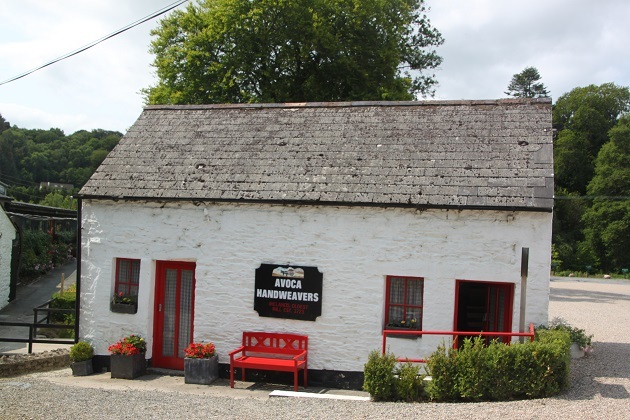 I wish I’d known about Avoca when we passed nearby on our first trip to Ireland. Very interesting and colorful post. It’s a lovely place to visit, the setting is stunning, the factory is really interesting and then you are tempted at the end with all the wonderful things they make! I loved it. I love this! I discovered this brand on our recent trip to Ireland and needless to say, came home with quite a few new items in my suitcase! 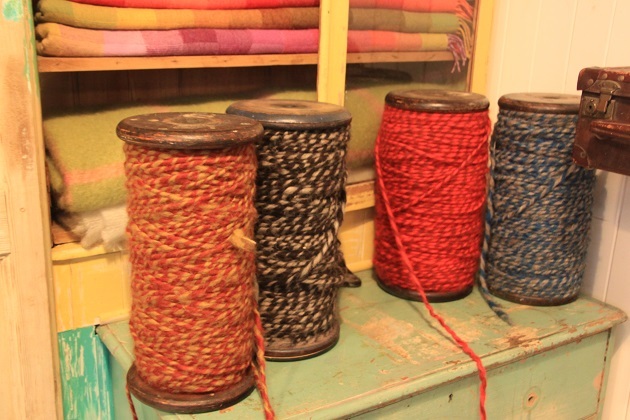 I love the brightly colored chairs and it must have been so fascinating to see them actually weaving. The outdoor areas looked lovely as well. So fun! It was such a lovely afternoon – something for everyone too! The location is stunning and the tour of the factory was very interesting. The shop at the end though…. so tempting – I love their stuff too! Nice tour Joy! Can’t wait to get back to Ireland! Which part are you planning to visit? The North West, Donegal and Connemara, have you been there? Been to Connemara about 20 years ago – before digital cameras but I remember some rugged and beautiful scenery. We went to Donegal a couple of years ago but just for a day – loads of driving – explored a bit of the mountains and then to the coast and enjoyed that too, Glenveagh National Park in particular. It looks fascinating. Must put it on my list. It’s a beautiful spot and a fascinating place too – plus some lovely souvenirs to buy! I haven’t heard of Avocado but it looks a good place to visit and the woollen products in lovely colours. 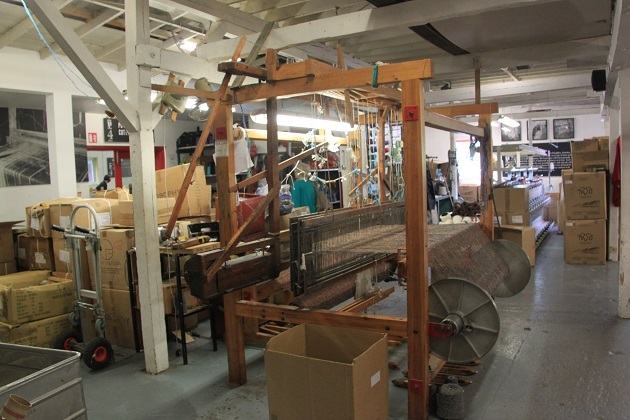 I love looking round old mills and watching the looms in action too. 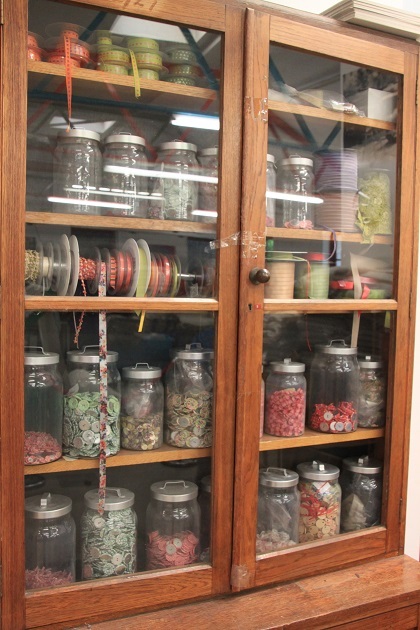 The colours everywhere just struck me – the yarns, buttons, trims were just gorgeous. 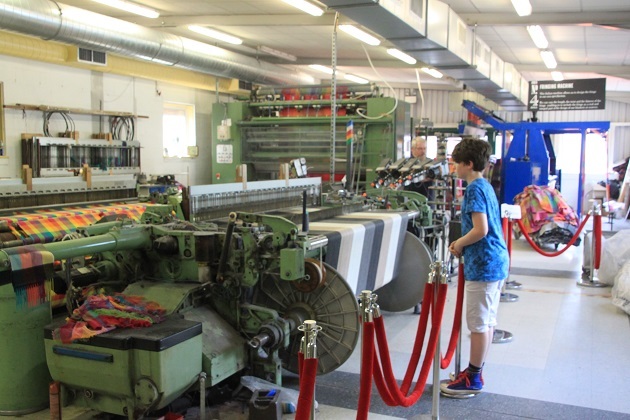 I loved it here that you could get up close to all the looms and chat to the weavers, a great experience. I want several pair of their wool socks! I wear wool socks all year round and the only type I purchase. The village and mill look lovely. I was hooked on Ballykissangel. I hope it returns as a rerun one day. 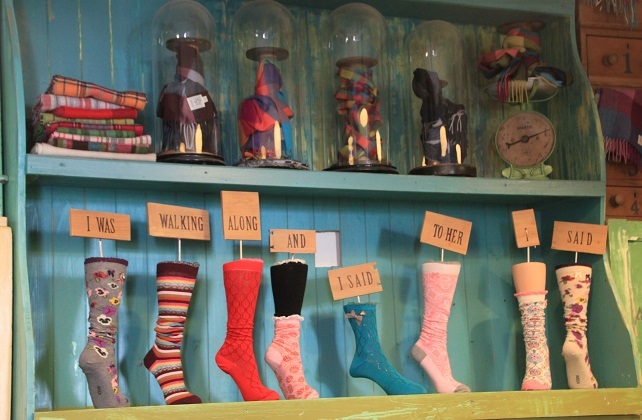 I never thought to try the socks… hmm another Avoca product to get hooked on!! We never watched Ballykissangel but now I wish we had! What a lovely place! 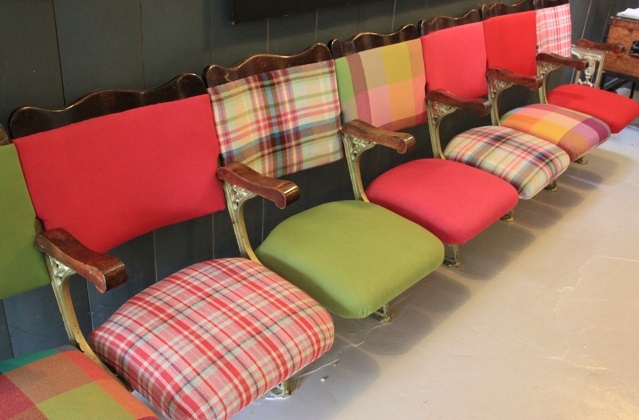 Love the colourful chairs. Everything is colourful here – I loved those chairs too!! What a wonderful spot. 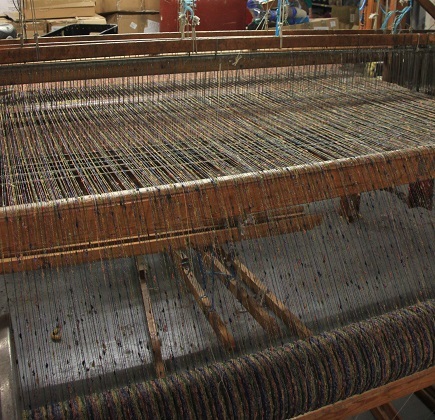 I would love to go on a tour of a weaving factory. I have been to old textile mills but only seen the looms still. It would be fascinating to see a place where they are still in operation. 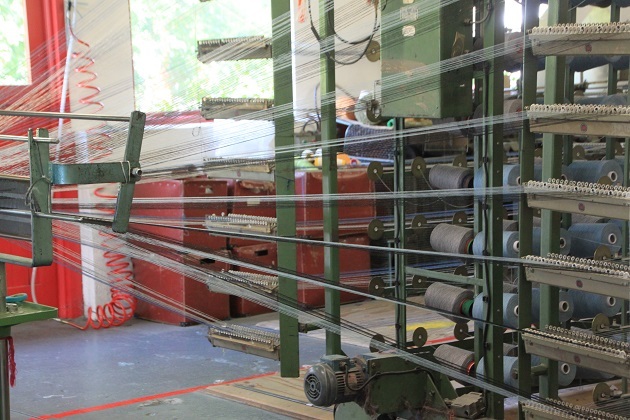 I have watched a hand loom weaver in operation but to see all of these machines creating the fabrics would be very cool. 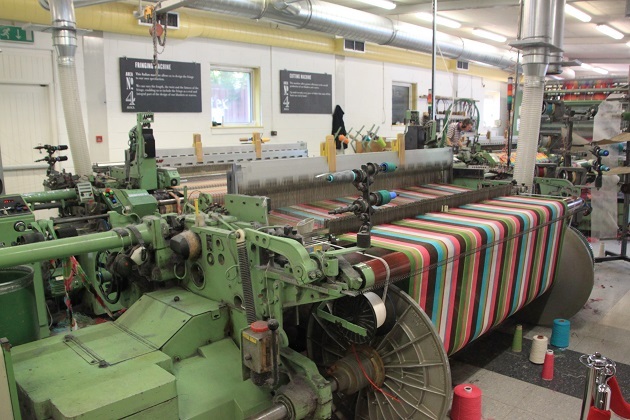 We stayed for ages in the factory just watching the looms and the people at work – it was mesmerizing. My great grandparents and grandparents were all weavers and my father worked his whole life in the Irish linen trade so this was extra interesting for us. The nice thing here too was the weavers were so friendly and chatty, most were so keen to come and talk about the process which made it even more interesting. 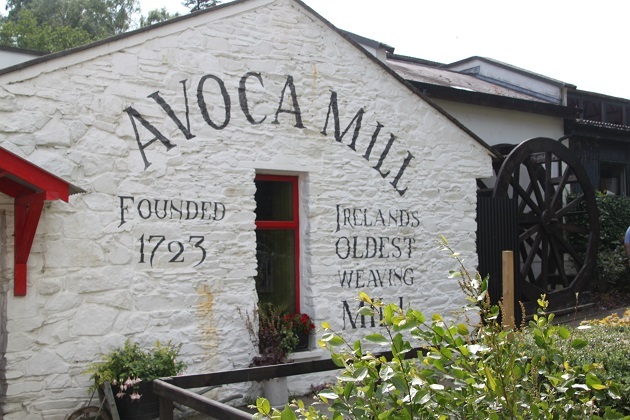 Since I first went to the Avoca Mill you blog about here the company has expanded into many favorite tourist locations around Ireland. Avoca’s marketing team is excellent, so good that they expanded greatly during the terrible recession that Ireland endured. I enjoy shopping in their stores but most of all I love dining in the cafés. The food is excellent and then some! And there are three or four Avoca cookbooks, available online, which good cooks should explore. I love the cafes too – never been disappointed and it’s a real treat for us!! Never thought about the cookbooks though – thanks for the tip! All I can say is simply wonderful. It is a beautiful spot Terry and to be able to see the weavers as they go about their work is extra special. I’d heard of the TV series but never watched it so the draw for me too Rosemary was the mill. I’d become hooked on their products several years ago when I discovered one of their shops – never looked back (my husband doesn’t necessarily think that’s a good thing!!). Their shops are wonderful, their cafes and restaurants are incredible too and I just love all of their rugs, throws and other things. Having been a fan of all that it was great to see where it is made, the tour was so interesting and the people so chatty and friendly. If ever you do make it to this area I highly recommend a visit!! Heaven to us that love crafts! Absolutely – I didn’t want to leave! I’ve been there! It’s a lovely spot and so interesting–your post really captures that. My husband and I are both weavers and we were at Avoca on a very quiet Sunday morning so we had a long talk with the handweaver and let my husband try out his loom. I wondered if you had been Kerry with your weaving background! My father was a weaver and was with us on this trip – we had to drag him out!! We all loved it though but Sunday morning sounded like the perfect time to visit! It would be such fun to go to a place like this with your father–he must’ve been in heaven! 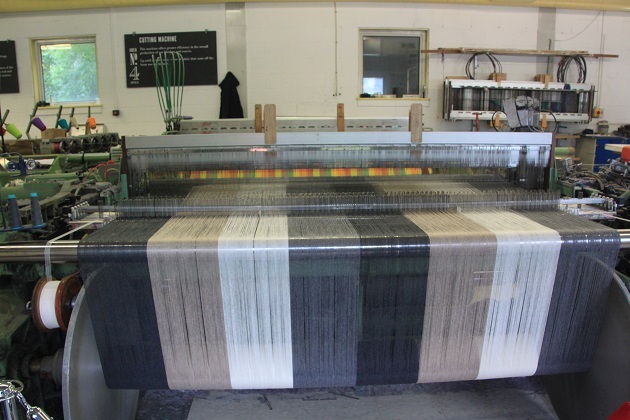 If you get to Ardara, in Donegal, there’s a wonderful hand weaver there, too–Eddie Doherty. Just looked him up – that looks like a great place to visit and my dad would love it. It’s a shame, we drove through Ardara a couple of years ago on a trip to Donegal but didn’t know about this. Oh well, always an excuse to go back…. thanks Kerry. This looks absolutely fascinating – I studied textiles at school and initially hoped to go into that line of work (but subsequently changed my mind!) 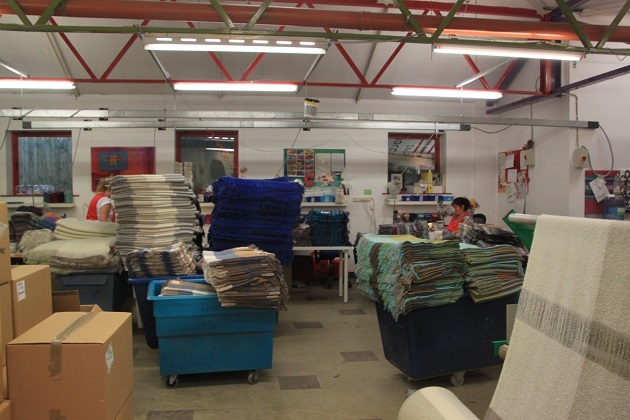 and remember learning all about woollen mills, weaving, dyeing processes. I’d love to visit somewhere like Avoca and see the theory I studied in action! 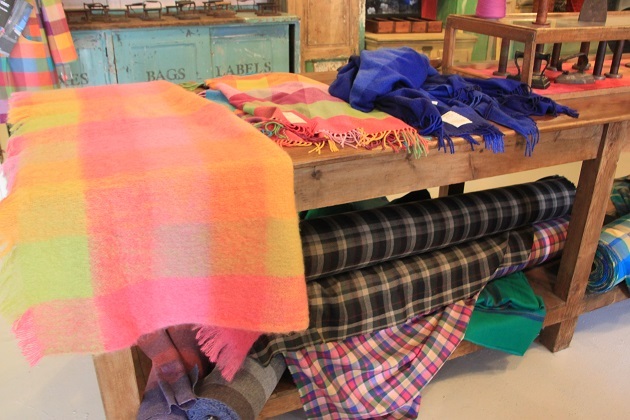 The multicoloured throws look particularly beautiful, I’d find it difficult to resist buying some homeware there! This would be the perfect place as you said to see theory in action! It’s such a beautiful place to visit (without an interest in weaving!) but we just loved looking around and chatting to the weavers. Beware of the shop though – enter at your peril as I discovered!! Shortly after my graduation I took my gran to a family reunion in Manitoba where we discovered another Avoca store… she bought herself a gorgeous royal blue cape which now belongs to me. Even now, almost 20 years later, it is the loveliest thing I own! 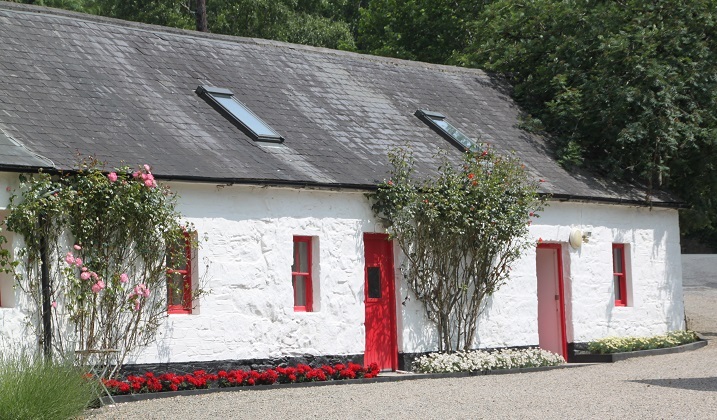 Next year my mom and aunt are planning a trip to Ireland to connect with our long-ago family history… I hope they get a chance to visit Avoca along the way! I had a grandmother who sounded very similar to yours Lara!! She also loved fabric and fashion, was very stylish and made all her clothes in a time when money was short! She made clothes for my sister and me as well – lovely memories. 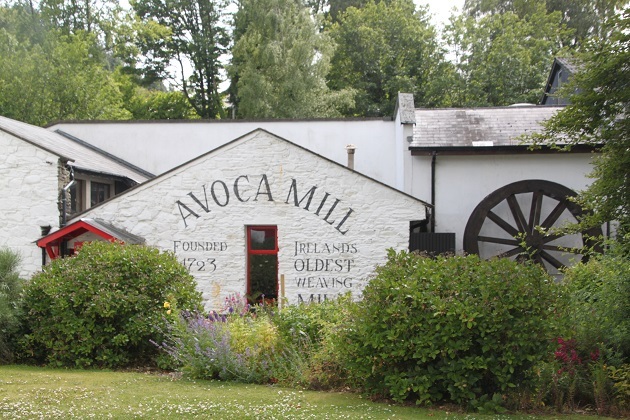 Avoca in Wicklow is just a wonderful place to visit – such a beautiful spot and then being able to see where those gorgeous products are made is extra special. I hope your mom and aunt do get the chance to visit as well – I highly recommend it!! Hope your November is going well too…. dark, cold and damp here but a great opportunity to batten down the hatches and get cozy! I loved Ballykissangel when it was on but didn’t get to Avoca on a trip to Ireland. Thanks for the tour; the mill looks fascinating. I did buy a bunch of their scarves as gifts at an outlet near Bunratty Castle. I just wish now we’d watched Ballykissangel – no idea how we never saw even a single episode! The mill was a great place to visit and so colourful and the gift shop was very tempting! Love the white-washed building. And such a unique experience to see the mill and inner-workings – definitely gives you a greater appreciation of the labor and work that goes into it. My parents go to Ireland every year and always bring back the nicest clothes and linens for my girls:). It was such a different but lovely afternoon out, I love the Avoca products anyway but we really enjoyed seeing all those looms running and the weavers at work. How lovely that your parents get to Ireland regularly – do they have family there? Maybe they can look out for the Avoca products – I am such a fan!